A few years before I moved away from Newfoundland, I took what for me was a memorable trip on ATV. I’m sure for many it wasn’t so special, but I was working in St. John’s and didn’t get to make as many longer excursions as I would have liked. Anyway, this one weekend, at some unknown or at least not remembered prompting, Elvis Cooper and I decided to head to his cabin, which was in behind Burgoyne’s Cove, several miles in the road. It was winter however, and this wasn’t a maintained road, so we couldn’t go by car, which was a big part of the reason for going! We drove the ATV and Elvis’ Skidoo over the road and ditches to Elliotts’s Cove, and filled up our tanks and some extra gas cans. Then we drove across Random Sound on the ice and got on the old railway bed. 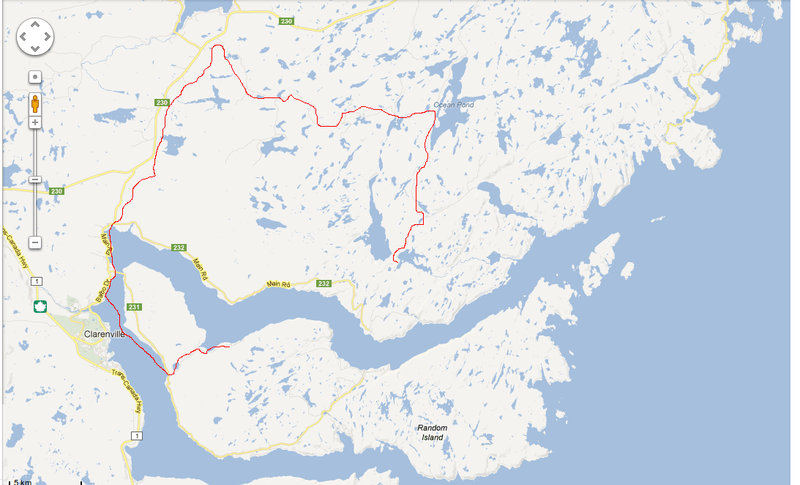 We made a little detour to Shoal Harbour as Elvis needed some skidoo part, but then we drove the railway bed down the Bonavista Peninsula till it hooked up with the private road on that side, near Lethbridge, then drove several more miles in that old road to the cabin. According to Google Maps, its about 43 km just from home to Burgoyne’s Cove, not counting the convoluted way we went, so I’m sure we added on nearly as much again if not more. When we got there, his mother, Joyce, had been there for a day or two, and had a big turkey cooked, which we devoured. After supper we all got on our machines and drove back out that road to the Dunrovin Motel to a dance, and a few drinks. Later that night we all made our way back to the cabin to sleep, and made our way home the next day. In some ways it was nothing special, but in more, such a long ATV trip, to a quiet cabin with a feed and friends was awesome. A memory I’ll always look back fondly on.